Here we go into the final installment. One last grouping of albums and one last collection of thudding riffs, heavy guitars, and enough drumwork to leave one’s head spinning by the time it wraps up. This final ten is all over the place, in terms of both genre and location. My lists tend to be pretty international always, but the consistent bouncing back and forth that is happening in this part has proven to be entertaining in its own right. This group also reveals just how much of 2018 turned out to be the year of cathartic release for me. Alongside all the genre-bending, all the experimentation, and all of the well-executed groove, I found that every once in a while this year a disc would hit that would just boil down to a half-hour-plus of yelling, and I would relish every single second of it. I’m sure we could credit that to the wider situation of the world these days but I’ve also always been a sucker for turning music into an instrument of release, and for some reason that approach won me over hard this year. So let’s begin with the final ten, and then a grouping of EPs I enjoyed this year, my final non-metal (ish) release recommendation, and a small (ish) closing paragraph… because why would I ever stop typing after just finishing the final ten? Those of you who know me well, and probably some of those who barely know me at all, will be aware of my general distaste for the whole “brotherhood of Metal” shtick that frequently gets bandied about by certain publications. Don’t get me wrong, the power of music to bring people together and unite them behind a common cause, a common feeling, still astounds me at times, but the whole cliché about Metal being a “brotherhood” is one that’s too often deployed as a disingenuous disguise for arrogant elitism or a flimsy excuse for chasing the lowest common denominator (and, occasionally, both at the same time). 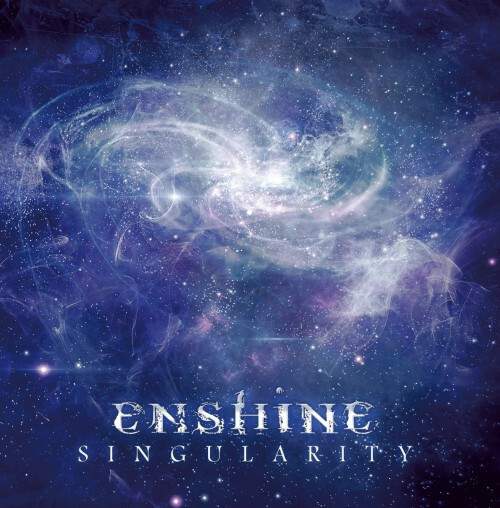 So I didn’t intend for this week to be some sort of “Seven Days of Tech Death”-style celebration, but considering that on Saturday I published an interview with James Malone from Arsis, on Monday my reviews of the new Beyond Creation and Gorod albums went up, and I already have a suitably tech-tastic edition of The Synn Report lined up for Friday… well, it looks like things have ended up that way regardless. 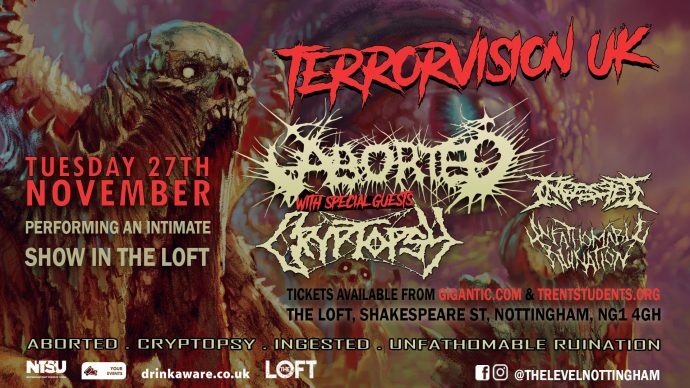 Cryptopsy tell you to “Fear His Displeasure“, but if you want to know what real fear is, take a turn in a Cryptopsy mosh pit. 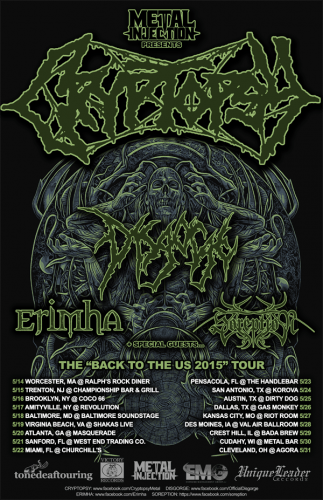 Those of us who’ve seen Cryptopsy live over the last few years have witnessed the spectacle of the band (metaphorically speaking) regularly injecting their audience into a cyclotron, quickly spinning it up to extravagant speeds, and then smashing it apart so that all the occupants go careening into a roiling mass of human wreckage. 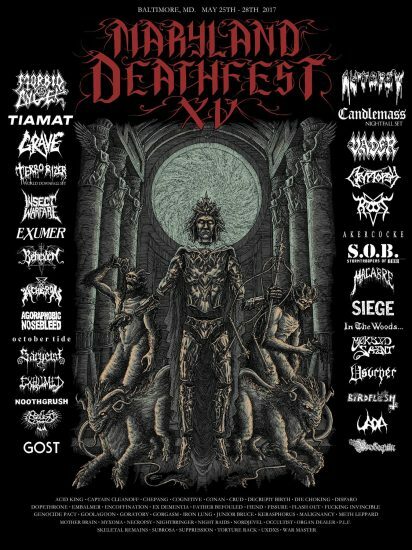 In case you hadn’t heard, there’s a little event called “Maryland Deathfest” happening this week, and I’m lucky enough to be attending for the second year in a row. As a result, my contributions to NCS are going to be somewhat… minimal… until next week (though I do have a little something blast-tastic lined up for Friday for you all), while I do my best to develop and nurse a cumulative five-day hangover/bangover. Such is the chaos that is my life at the moment (in between trying to get my End of Year List/s done, I’ve also been putting together a PhD proposal/application, booking a photo shoot for Beyond Grace, TRYING to book shows for next year for us, and helping some good friends move house) that I almost forgot about my annual semi-traditional round-up of all the great EPs I’ve heard this year! Yes, yes, I know there are several bloggers and/or sites out there who argue that EPs should be considered right alongside full-length albums when it comes to summing up matters at the end of the year… but I’m not one of them. Here’s a round-up of news, new album artwork, and a couple of new songs I spotted over the last 24 hours. 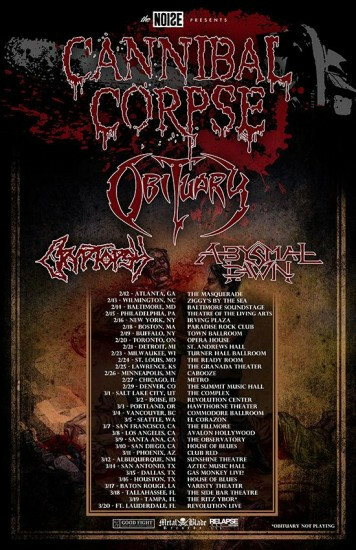 We’ll start with some tourism news: Yesterday it was announced that Cannibal Corpse will be headlining a big North American tour that begins on February 12 and runs through March 20. 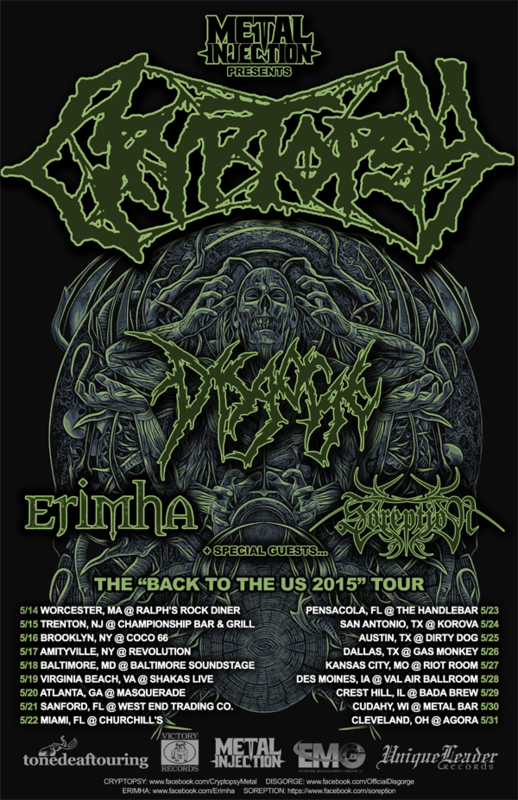 And the direct support for the tour is pretty eye-popping: Obituary, Cryptopsy, and Abysmal Dawn will be along for the ride. In case you missed it, Friday was a kind of slow date for the site. We’ve had times like this before, where various outside influences conspire to make sure that we post with the speed at which animals are able to escape the La Brea Tar Pits. That doesn’t mean we weren’t up here in space, lookin’ down on you and keeping track of various rumblings going throughout the web. I’ve gathered together eight fairly recent developments in the heavy metal world for you all to enjoy. As usual, I’ve tried to catch stuff that has flown under the radar and mix it in with a few things that have likely made a big splash across the web already. 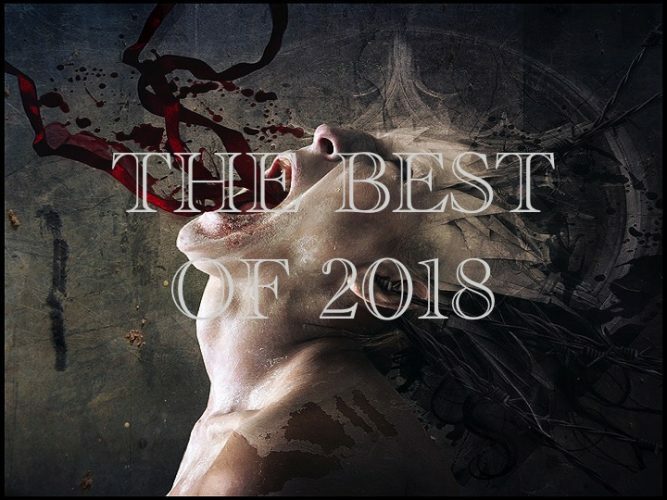 This collection of stories covers a pretty good swath of the globe in terms of distance but has a foot heavily planted in the death metal and doom metal realms, making a few labored grasps to the outside genre world. Here are a four new (or new-ish) things I saw and heard since the weekend began that I’m really liking. I could keep them to myself, but I believe that goes against the first rule of blogging: Assume that everyone is fascinated by everything that interests you, and therefore keep nothing to yourself. You can think of this as a death metal sandwich, two slices of rotting death metal bread on the outside and two unusual goodies in the middle. 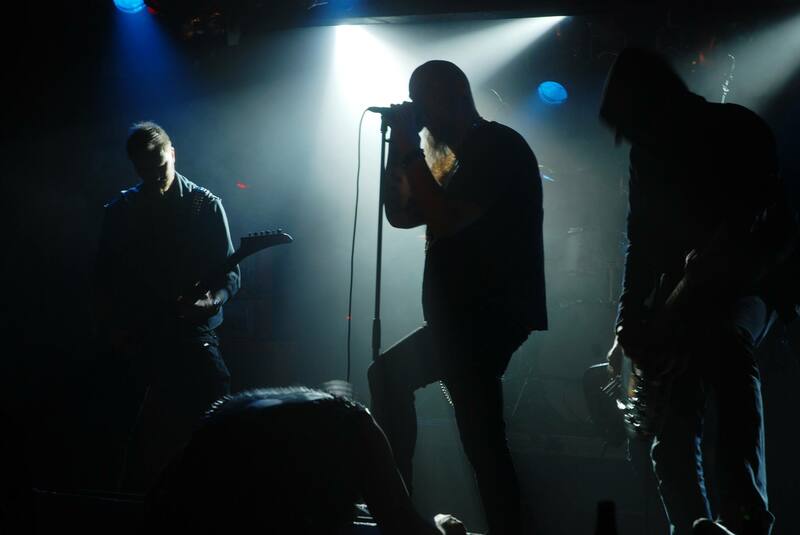 The Music: Doing it the flesh-crawling bone-smashing old way, and doing it right. OOOF!